As a field concerned with the production, consumption, and analysis of texts, English studies is also necessarily and uniquely tied to the technologies that support those activities. As those technologies evolve, the field evolves new research and teaching practices and new ways of using and thinking about digital tools. No longer the sole purview of a handful of specialists, digital texts (multimedia, Web content, digitized material, etc. ), tools (software and hardware), and user practices (how readers and writers interact with, read, compose, analyze, share, and remix digital texts) pervade the field, from literary studies to writing studies and beyond. 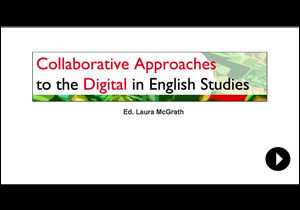 Although many English studies professionals have assimilated, investigated, and experimented with digital tools and associated practices on their own, such work is often facilitated by strategic collaborations. In fact, as this collection’s chapters demonstrate, forming collaborative partnerships is often the most productive way—if not the only way—to address research, professionalization, teaching, program development, and other challenges that arise as the field responds to digitality. Collaborative Approaches to the Digital in English Studies joins the ongoing conversation about collaborative work in the humanities. Instead of focusing exclusively on the digital humanities or emphasizing only the large-scale computational analysis or archival projects typical of that field of study, the collection focuses on a variety of projects led by or involving English studies professionals in particular. In doing so, the collection demonstrates growing interest in and diverse application of collaborative methods within the field and provides examples of the exigencies that have prompted a move away from the stereotypical lone-scholar model of scholarly work toward collaborative endeavors. The first aim of the collection is to present readers with compelling examples of how English studies professionals are employing collaborative approaches to the digital, thereby providing an up-to-date perspective on the nature of the work colleagues are doing as they come together around technology-related research and teaching questions. The second aim is to provide readers with concepts and models they can use in their own work as educators, researchers, and administrators. McGrath, Laura (Ed.). (2011). Collaborative approaches to the digital in english studies. Logan, UT: Computers and Composition Digital Press/Utah State University Press. Retrieved [Insert retrieval date here] from http://ccdigitalpress.org/cad. McGrath, Laura, ed. Collaborative Approaches to the Digital in English Studies. Logan, UT: Computers and Composition Digital P/Utah State UP, 2011. Computers and Composition Digital Press. Web. [Insert date of access here]. http://ccdigitalpress.org/cad. Copyright © 2011 Laura McGrath and Utah State University Press/Computers and Composition Digital Press. Some rights reserved.